Nance, J. P., Vannella, K. M., Worth, D., David, C., Carter, D., Noor, S., Hubeau, C., Fitz, L., Lane, T. E., Wynn, T. A. and Wilson, E. H.* (2012). Chitinase dependent control of protozoan cyst burden in the brain. 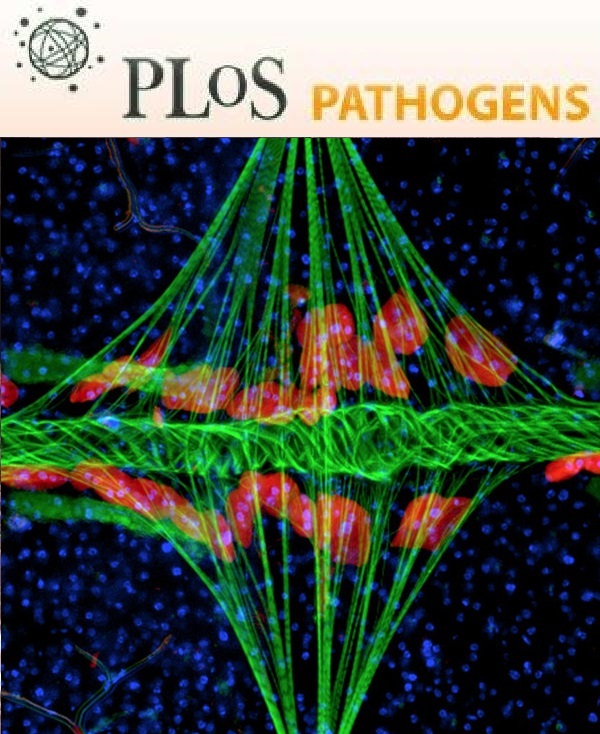 PLoS Pathog 8(11): e1002990. David, C., Nance, J. P., Hubbard, J., Hsu, M., Binder, D. and Wilson, E. H.* (2012). Stabilin-1 expression in tumor associated macrophages. Brain Res 1481: 71-78. Nichols, H. L., Saffeddine, M., Theriot, B. S., Hegde, A., Polley, D., El-Mays, T., Vliagoftis, H., Hollenberg, M. D., Wilson, E. H., Walker, J. K. and DeFea, K. A. (2012). beta-Arrestin-2 mediates the proinflammatory effects of proteinase-activated receptor-2 in the airway. Proc Natl Acad Sci U S A 109(41): 16660-16665. Harris, T. H., Banigan, E. J., Christian, D. A., Konradt, C., Tait Wojno, E. D., Norose, K., Wilson, E. H., John, B., Weninger, W., Luster, A. D., Liu, A. J. and Hunter, C. A. (2012). Generalized Levy walks and the role of chemokines in migration of effector CD8+ T cells. Nature 486(7404): 545-548. Noor, S. and Wilson, E. H.* (2012). Role of C-C chemokine receptor type 7 and its ligands during neuroinflammation. J Neuroinflammation 9: 77. Ploix, C. C., Noor, S., Crane, J., Masek, K., Carter, W., Lo, D. D., Wilson, E. H.* and Carson, M. J. (2011). CNS-derived CCL21 is both sufficient to drive homeostatic CD4+ T cell proliferation and necessary for efficient CD4+ T cell migration into the CNS parenchyma following Toxoplasma gondii infection. Brain Behav Immun 25(5): 883-896. Noor, S., Habashy, A. S., Nance, J. P., Clark, R. T., Nemati, K., Carson, M. J. and Wilson, E. H.* (2010). CCR7-dependent immunity during acute Toxoplasma gondii infection. Infect Immun 78(5): 2257-2263. Wilson, E. H.*, Weninger, W. and Hunter, C. A. (2010). Trafficking of immune cells in the central nervous system. J Clin Invest 120(5): 1368-1379. Wilson, E. H.*, Harris, T. H., Mrass, P., John, B., Tait, E. D., Wu, G. F., Pepper, M., Wherry, E. J., Dzierzinski, F., Roos, D., Haydon, P. G., Laufer, T. M., Weninger, W. and Hunter, C. A. (2009). Behavior of parasite-specific effector CD8+ T cells in the brain and visualization of a kinesis-associated system of reticular fibers. Immunity 30(2): 300-311. Carson, M. J. and Wilson, E. H. (2013). Visualizing chemokine-dependent T cell activation and migration in response to central nervous system infection. Methods Mol Biol 1013: 171-183. Ghang, Y. J., Schramm, M. P., Zhang, F., Acey, R. A., David, C. N., Wilson, E. H., Wang, Y., Cheng, Q. and Hooley, R. J. (2013). Selective cavitand-mediated endocytosis of targeted imaging agents into live cells. J Am Chem Soc 135(19): 7090-7093. Clark, R. T., Nance, J. P., Noor, S. and Wilson, E. H.* (2011). T-cell production of matrix metalloproteinases and inhibition of parasite clearance by TIMP-1 during chronic Toxoplasma infection in the brain. ASN Neuro 3(1): e00049. Harris, T. H., Wilson, E. H., Tait, E. D., Buckley, M., Shapira, S., Caamano, J., Artis, D. and Hunter, C. A. (2010). NF-kappaB1 contributes to T cell-mediated control of Toxoplasma gondii in the CNS. J Neuroimmunol 222(1-2): 19-28. Jordan, K. A., Wilson, E. H., Tait, E. D., Fox, B. A., Roos, D. S., Bzik, D. J., Dzierszinski, F. and Hunter, C. A. (2009). Kinetics and phenotype of vaccine-induced CD8+ T-cell responses to Toxoplasma gondii. Infect Immun 77(9): 3894-3901. Stumhofer, J. S., Laurence, A., Wilson, E. H., Huang, E., Tato, C. M., Johnson, L. M., Villarino, A. V., Huang, Q., Yoshimura, A., Sehy, D., Saris, C. J., O'Shea, J. J., Hennighausen, L., Ernst, M. and Hunter, C. A. (2006). Interleukin 27 negatively regulates the development of interleukin 17-producing T helper cells during chronic inflammation of the central nervous system. Nat Immunol 7(9): 937-945. Wilson, E. H., Wille-Reece, U., Dzierszinski, F. and Hunter, C. A. (2005). A critical role for IL-10 in limiting inflammation during toxoplasmic encephalitis. J Neuroimmunol 165(1-2): 63-74. Wilson, E. H. and Hunter, C. A. (2004). The role of astrocytes in the immunopathogenesis of toxoplasmic encephalitis. Int J Parasitol 34(5): 543-548.